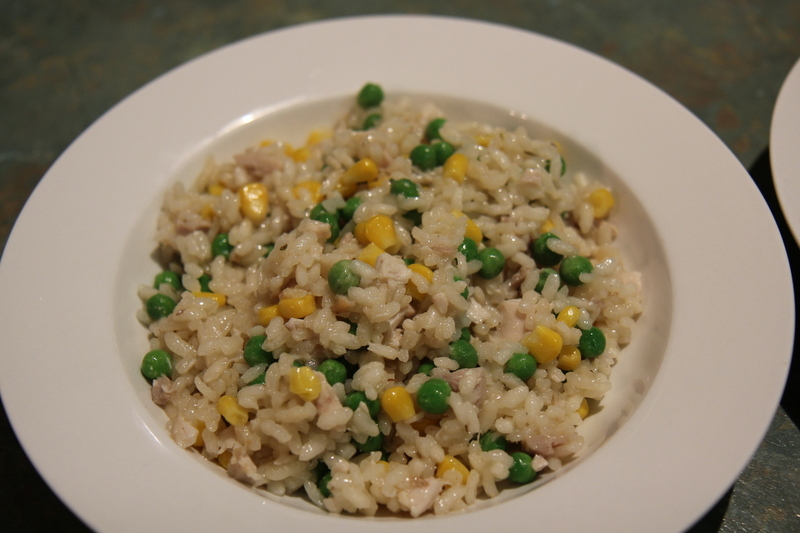 My kids aren’t terrific at eating pieces of meat, so meals that have everything mixed in together usually go down well – and this risotto is no exception. It gets scoffed down by everyone – in fact, after a torturous few months it was the very first meal that my Harry ate when he was 9 months old! Approx 300g coarsely chopped cooked chicken. In a large frying pan, melt the Nuttelex and oil and cook onion, garlic and thyme, stirring until onion is soft. Add rice and stir for about 1 minute, ensuring the rice in coated with the herb mix. Add approx 1/2 cup of stock at a time and stir consistently over a low/medium heat until the liquid is absorbed and the rice is creamy and just tender. Remove from heat and stir through the chicken and veggies. Serve immediately. Feeds 5-6 adults. If your diet allows it, you could also stir though 80g of finely grated parmesan cheese before the chicken. Or use a little sprinkling of Nutritional Yeast for a cheesey flavouring. For a vegan option for this dish, remove the chicken and use 2-3 cups of sliced button mushrooms. Don’t wait until the end to add them in though. Add them to the meal about 2 minutes after the onion and garlic go into the pan. Total cooking time will be about 25-30mins. I’m not sure about your house, but in mine, the half hour before dinner is filled with bathing, dressing and wrangling 3 hungry little people, so standing in front of the stove for 30 mins doesn’t work very well! So I’ve experimented a bit and I’ve found that an hour or 2 before dinner, when I have a bit more time, I can follow all steps through until there is about 1- 1 1/2 cups of stock remaining in the saucepan. Turn off both pans and leave them covered. Then just before dinner, bring the stock to the boil and put the risotto on a low heat and finish adding the stock before following the final steps. This one isn’t really suitable for freezing. If you do have leftovers, you could reheat it the next day, but add a bit of stock (a couple of tbsps) before you zap it.